College of Charleston Libraries / About / News / College of Charleston / CofC has moved to PAPERLESS Course-Instruction Evaluations! CofC has moved to PAPERLESS Course-Instruction Evaluations! As of this semester, there are no longer paper course evaluations. Students can begin their course evaluations on Nov 15th – December 6th. If you have a few moments while you are in the Addlestone Library, the link for course evaluations is easily accessible on the 250 computers in the library! Students can also access the evaluation forms directly at coursereview.cofc.edu, MyCharleston, or via their Edisto email invitation. Team-taught and linked course will have an online evaluation for each professor. 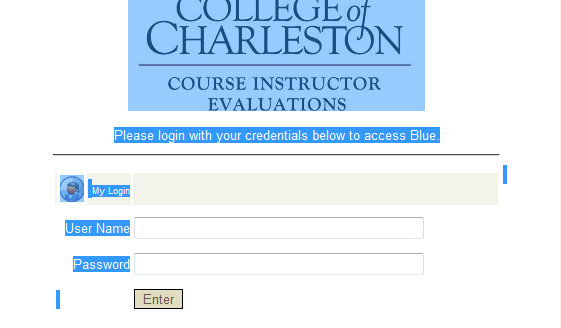 Students should use their Cougars user name and password to access their Course Instructor Evaluations for each class.